Available from October, this 750 sqft suite of offices is based within the secure environment of Red Rose Self Storage in Leyland. The suite includes 3 offices, ladies and gents W/C facilities and small kitchen room and comes complete with ample off road car parking. The site is protected by BT RedCare Police Response alarm systems and CCTV. We are looking for offers in the region of £195 p/w + VAT for these offices, a price which is inclusive of electricity, business rates, buildings insurance and service charge. These offices are ideal for someone looking for an excellent working environment, without the worries of escalating costs. For more information, please contact rob@workspaceproperties.co.uk or call 07813 656999. We are delighted to now be able to provide more details on the new units which are almost ready for occupation on Chorley Central Business Park, Stump Lane, Chorley. 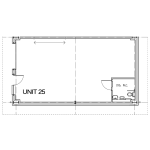 The units are 750 sqft (69.67 sqm) Business (B1,B2,B8 inc. alt. permitted use) units. They provides ample space for use as storage, trade counter, workshop, office or combination. The units have been constructed to exceptionally high standards. * 3 phase electric supply. Chorley Central Business Park is a 2.5 acre site, 50 metres from the main bus routes and 450 metres from Chorley train / bus station. Ideally located for the main motorway networks with easy access to / from M6, M61 and M65. For more information, or to view the units, please do not hesitate to contact us.